Jurassic World already fulfilled the nostalgic yearning of Jurassic Park diehards with cameos from the original film’s two most beloved characters: B.D. Wong’s Dr. Henry Exposition and the night-vision goggles, charismatic as ever. But that hasn’t stopped fans from demanding even more things that they remember in the upcoming sequel, clenching their plump baby fists into a ball and screaming that they deserve to see Jeff Goldblum again, give us Jeff Goldblum, put him in an unbuttoned shirt and have him lie seductively on a table as he chastises us about math. 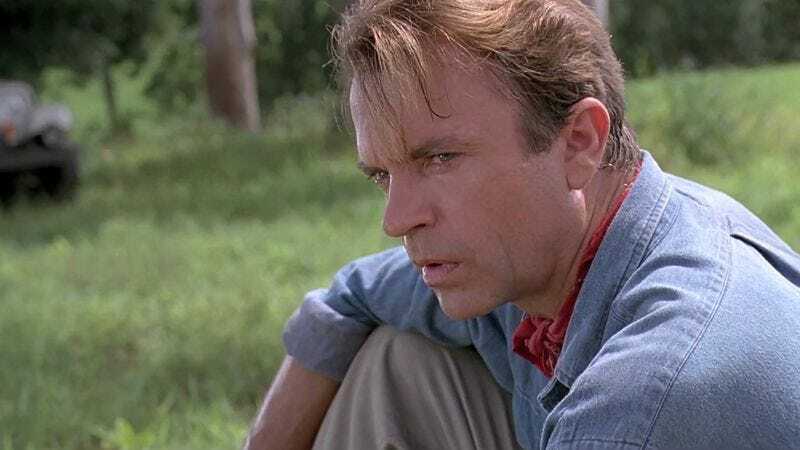 Also, maybe Sam Neill too, if there’s time. While Goldblum has demonstrated a typically laissez-faire, freeform-jazz-piano attitude toward ever being invited back, Neill had a slightly more maudlin take in a recent interview with ShortList, suggesting his Dr. Alan Grant is likely too busy being dead. Or worse, he’s become an accountant—in Ohio. “I think the problem is that no one knows where Alan Grant is anymore. He’s retired from paleontology. He’s sick to death of dinosaurs and running. He’s not quite as fleet of foot as he was, and he’s now retired to Dayton, Ohio, and has a very successful accountancy business… I think that’s what’s happened to Alan. Either that or he’s dead. As Neill explained, Dr. Grant’s succumbing to suicide and/or CPA exams is a tragic, yet inevitable result of the traumas he’s suffered, as well as our nation’s dismayingly inadequate treatment for veterans of dinosaur stuff. “How do you recover from all of that stuff?” Neill asks. “I don’t think therapists are trained to deal with post-dino stuff. No. I don’t think you get over it. Accountancy would be one way.” And as seen in Jurassic Park 3, that dino stuff has a way of breaking through the paddock of your dreams, until you’re reduced to the sort of frazzled, depressive mess who enjoys spreadsheets. Still, unlike someone you might know who may be threatening accountancy, Neill’s statement probably shouldn’t be taken too seriously. Like Jeff Goldblum—with whom he’s soon to co-star in Thor: Ragnarok on this, a day unusually heavy with Sam Neill—he may just be coyly playing hard to get, confident that Dr. Grant’s eventual return is inevitable. After all, as Jurassic Park showed us, nothing is so far gone that it cannot be brought, kicking and biting, back into this world, whether it’s trapped inside fossilized amber or just doing taxes in Dayton.